If you’ve tried to replace a small counter with a piece of granite, you probably ran into a common problem: granite fabricators don’t want to sell a little piece, they want to sell the whole slab. Or, they want to charge you an arm and a leg for the piece you need. Fortunately, HGTV has popularized the use of granite remnants for small counter tops and has encouraged people to call around to local granite companies asking for remnants. Smart companies sell what people want to buy, right? I had a listing last spring that needed a small counter top to replace some seriously ugly brown tile in the bathroom. Fortunately, the owner’s niece runs Toluca Granite here in Austin and was able to cut a few counters from her supply of granite remnants left over from other jobs. I know the owner of Toluca Granite personally, and have picked through her selection on many occasions, looking for small tabletops, or the occasional piece of marble for a cheese board. 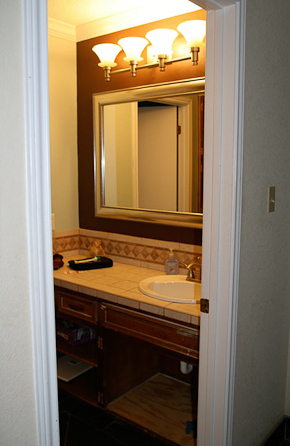 You can see that the update to this bathroom was pretty much paint and the piece of granite. 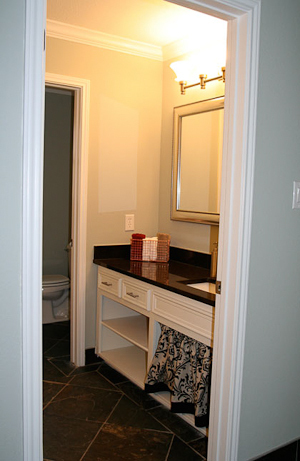 The little fabric skirt covered up the whole under the sink because the doors were missing. I am not a HGTV watcher but I have wondered if you could find remnants. Neat idea Alison!